The MBA in media management was established thanks to a long-term collaboration between GUC and DW Akademie, which has been organizing media-related seminars regularly at the university in Cairo. "We hope this course will develop to form the nucleus of further academic and intercultural exchange in Egypt's media sector," said Professor Christoph Schmidt, head of the academic program at DW Akademie. Founded in 2003, the German University in Cairo (GUC) is a young and innovative educational institution based on the German university system in both its study program and its course content. "Media studies are particularly interesting in Egypt at the moment because of the political, cultural and social changes the country is undergoing," commented Professor Ahmed Amin Mohamed, the coordinator of the MBA program. "The media have played a key role in this process of transformation." The first intake of 13 students, chosen from more than 100 applicants, includes engineers, economists, communications professionals and media managers. The second intake of new students is expected in March 2013. The development of the MBA's curriculum is being financed by the German Federal Foreign Office as a part of the German-Egyptian transformation partnership. In the long term, DW Akademie plans similar collaborations with other universities in selected partner countries. The idea is to export DW Akadamie's master's course in International Media Studies (IMS), a unique program which has been running since 2009 and combines journalism and media management with development studies. 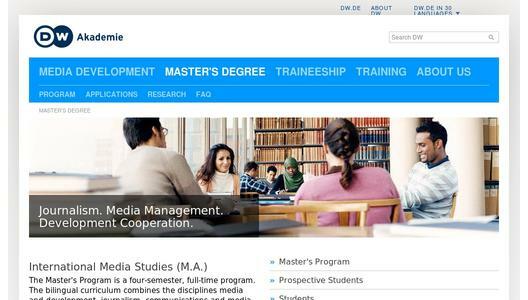 DW Akademie is Deutsche Welle's international center for media development, media consulting and journalism training, which aims to promote diversity of opinion and freedom of speech around the world. Apart from the master's program IMS, DW Akademie also provides a cross-media traineeship for aspiring German and international journalists at DW's broadcasting centers in Bonn and Berlin.